Hey everyone, patch 1.2 will roll around soon (estimates for its deployment are early –mid April). This means that you have maybe about 1-3 weeks to be prepared for 1.2. What is there to prepare you ask? Plenty of things! If you are a huge overachiever, the next few weeks you will be quite busy! This article is divided into sections, jump to a section that interests you or read all of it! If you have being keeping up with the PvP changes in 1.2, you will know that Centurion and Champion sets are no longer available for purchase. These sets are fully moddable (including the armoring slot) in 1.2 so if you like their looks, definitely buy a set now! Personally, I know I will be purchasing the Centurion set just for their looks as they have a shade of purple rather than the overused red on all the other Empire endgame gears. More importantly, if you are planning to jump into PvP at all in the future and you are no where near Valor rank 60, having a full set of Champion will also give you a hand for PvPing in 1.2. The new Recruit set that is coming in 1.2 to replace the Champion/Centurion has worse stats and is not moddable at all. The only good thing about the new Recruit set is that it has much higher expertise (about ~4% more PvP bonus than the Champion set, ~7% more PvP bonus than the Centurion set) and can be brought for around 300k credits for the whole set. It solves the whole chicken and egg dilemma pre –1.2 where you need to PvP get to expertise gear but if you have no expertise at all you will likely get slaughtered. If you are already reached Valor 60 or about to, get as many Battlemaster pieces as you can! You might be wondering why you should bother when all the Battlemaster pieces can be brought via Warzone Commendations in 1.2. Well, Battlemaster gear is needed to trade in for the War Hero stuff, which is the newest tier of PvP armor. If you already have a couple of BM set on you, you can just jump straight into ranked warzones right away and start earning Ranked Warzone Commendations for your War Hero gear. Think of it this way, you can either grind for BM gear now or after 1.2. If you grind for it now, you will be slightly ahead! Lastly, and especially if you don’ have a full BM set, you can stock up on the Warzone Commendations now. The current cap for Warzone Commendations is 1000 and that cap will be raised to 2000 in 1.2 (Note that this is the cap only for normal Warzone Commendations, the cap for Ranked Warzone Commendation, if there is one, is likely to be much higher as some items costs over 3k Ranked Warzone Commendations to purchase). Once you have reach the cap, you can purchase Mercenary Commendations. The updated exchange rate (as of March 27 PTS patch) is 10 Mercenary Commendations for 10 Warzone Commendations so you can stock up now with 1k of Warzone and 1k of Mercenary and once patch 1.2 hits you can trade the Mercenaries in to end up with 2k Warzone Commendations right away. The new Corellia dailies in Black Hole rewards about 9 Daily Commendations per day. 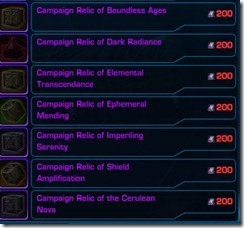 The Ilum and Belsavis dailies currently rewards 25 Daily Commendations per day. So if you set your heart on grinding dailies, you can get about 200 Daily Commendations in 8-9 days and also get a nice bit of credits before patch 1.2 hits. For those of you soloing Lights Out on the Empire side, you will be sad to know that it may no longer be possible to solo this Heroic Daily come 1.2. The part that stood out in the patch notes is this: Lights Out: A mission step to defeat Field Commander Anhur has been added to this mission. 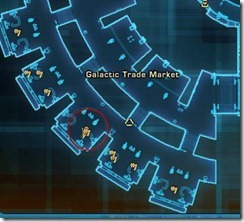 In patch 1.1.5 an unmarked crystal vendor was added directly opposite the Galactic Trade Terminal. This vendor will be removed once patch 1.2 comes out and he sells crystals, the most important one is probably white crystals. 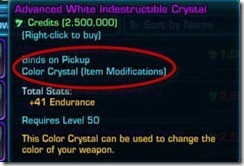 The reason for that is that other color crystals can still be obtained via crafters once 1.2 hits but white crystal will be gone from the game (see this dev post for confirmation). So save up your credits and buy those white crystals if that is your thing! The cheapest white crystal cost 1 million credits (+31 stats) while the top tier costs 2.5 million credits. You might be wondering if it is worth the purchase if the crystals might be “replaced” in the future by crystals with better stats. This dev post should assure you that a replacement is not coming anytime soon. Sadly, these white crystals are BOP (Bind on Pickup) so if you are looking to make a profit, this is not the way. The other color crystals are BOE (Bind on Equip). So just to recap. The vendor that is selling all these cool color crystals will be gone in 1.2. The white crystals he carries will no longer available be obtainable in 1.2. 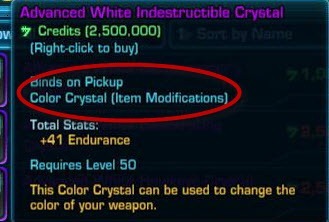 The rest of the color crystals can be acquired via crafters or brought from people who saved them up pre-1.2. Here is a list of all the White crystals you can kiss goodbye. Prince/Sovereign requires valor 65 to purchase so if you are not valor 65 by the time 1.2 hits, you will lose your opportunity to purchase them. These speeders will become tradable if you don’t use them so if you want to collect them now and sell later now it’s the time to do it (not entirely sure if Prince/Sovereign will become tradable or not). Tirsa Prime is being sold currently for 1 million credits and after 1.2 it will be moved to the VIP vendor at an increased cost. Personally, it is such an ugly mount (looks similar than the one you get from killing Soa/Karagga on normal mode or from killing the last boss of Kaon Under Siege flashpoint) that I wouldn’t really bother with it. 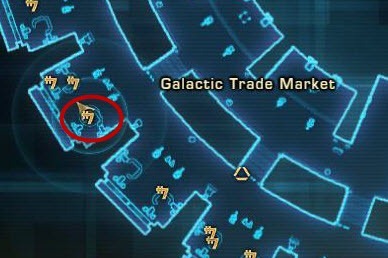 Tirsa Prime/Korealis Commander/Korrealis Baron are being sold at the Vehicle vendor near the GTN (Galactic Trade Terminal). 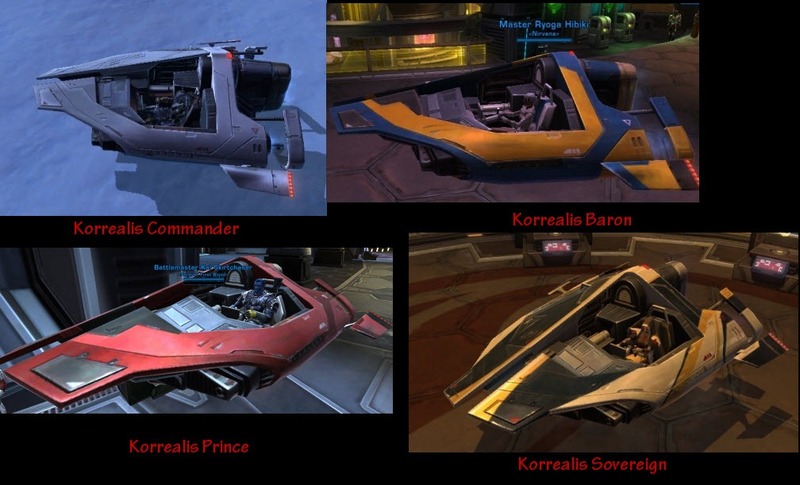 Korrealis Prince/Sovereign are sold on the PvP vendors in the Combat Training Section of the fleet. Legacy system is coming with 1.2 and it has something pretty much for everyone. If you want the class buffs from the other 3 classes, you will need to level up alts and have them finish Chapter 2 of the class quest. This will allow you to receive 3 other class buffs everytime you press the button for your own class buff (see dev clarification/confirmation here). If you want their cool class specific Heroic abilities on all your characters, finish chapter 3 on all of them. If you want to unlock their race for use on all your future characters, grind them to 50 or pay 1.5 million credits. If you want to get a small bonus to your Accuracy, Crit chance, Surge, Healing received, Max health, and a huge boost to Presence, then it is time to do all the quests for your companions! These bonuses can be unlocked as soon as 1.2 hits if you do all the companion quests now. If you want some of the cool stuff like reduced CD on fleet pass, reduced CD on quick travel, rocket boost (advanced sprint), fancy stuff for your ship (repair droid, mailbox, GTN, training dummies), and cool new emotes, be prepared to grind out those legacy levels and credits! Most of these features only require a max legacy level of 15 (ship GTN is an exception) but cost a huge amount of credits. If you want all of these features, be sure to have a couple million credits saved up! Crafting is getting a huge revamp in 1.2 with many big changes that are making professions other than Biochem much useful at endgame. The first thing you will want to do is stock up on the endgame crafting materials (Biometric Crystal Alloy, Self-Perpetuating Power Cells, Alien Data Cubes, and Rakata Energy Nodes). Quite a lot of these drop from Operations but the Biometric Crystal Alloy is obtainable from doing Hardmode flashpoints. The reason for that is these materials will become tradeable in 1.2 but drops much less frequently. So hoard them now and sell later! Armormech, Armstech, and Synthweaving are getting the ability to craft augments in 1.2 as well as the ability to reverse engineer items into empty orange shells with the same name and appearance. This allows for further character customization and also the possibility of augment slots. So if you don’t have a character with one of these crafting skills you might look into leveling an alt for that! If making different color crystals is your thing, you might also want look into artifice as they are getting quite a few schematics that allow them to craft crystals of pretty much every color in existence except white. Slicing is likely to be a highly profitable gathering skill in 1.2 since it will be the source of mats required by all the augment crafting. Lastly, the 3 mission skills (Investigation, Treasure Hunting and Underworld Trading) are likely good ones to pick up as well since they now have an increased chance to provide schematics. It may seem like that I am recommending you to pick up almost every crew skill profession. This is true to some extent! Crafting is getting such a huge revamp in 1.2 that it would be silly to not jump on the bandwagon and make some profit in the process! Since you will be likely leveling alts for the Legacy system anyways, why not cover your crew skills too! can U unlock the class buff with credits? or is it only by finishing chapter 2? i just found the cost of credits a bit to much xD but the feature are cool!, thanks for the head up! Awesome guide! thanks for sharing! So if I am valor 57 w/maxed Merc and Warzone commendations, I should just save those commendations for 1.2 rather than spend them on a Battlemaster commendation when I hit 60? My dilemma exactly. Would like to know opinions. Here’s the skinny. As long as 1.2 is not announced (in other words, atleast several days away) I would continue spending WZ comms to get BM comms. Then, when 1.2 is announced (again Bioware have said we will know the drop date well in advance) you can grind and save up 1000 WZ comms and 1000 merc comms. Make sure when 1.2 drops you have 1000/1000! It wil depends on when you reach valor 60. The ETA for patch 1.2 is not known. You may have anywhere from 1-3 weeks for its release. If you reach valor 60 and patch 1.2 is still not announced, then by all means by buy some BM commendations. Save your warzone and merc comms for 1.2 Your 1k/1k warzone and merc will buy more in 1.2 then they will now. Currently that gets you 1 BM comm. That gets you a bracer, belt, or relic. In 1.2 BM can be bought with warzone comms at a much cheaper rate What makes this better is you can convert merc back to warzone in 1.2 at 10:10 so you have 2000 warzone at your discretion. This lets you buy any 1 piece of BM or mutliple of the cheaper pieces. 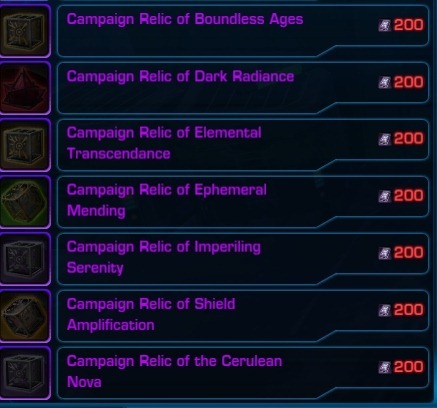 You could techinally buy both relics and bracers. For a full list of cost look at the PVP gearing in 1.2 article. Buying BM comms isn’t worth it, but definitely buy the BM implants and earpiece with them. Based on the prices of the items in 1.2, buy the chest piece with BM comms first, then belt/bracers, relics if you want, head piece, then weapon. That’s the most efficient use of BM commendations. Do you know does the artifice crew skill trainer have recepies for them? So the new daily gear can be bought with the current daily comms? No. The new endgame gear are brought with Black Hole Commendations or obtained as drops from hardmode Explosive Conflict. Corellia dailies do not give you Black Hole Commendations, they give you daily commendations instead. Corellia weekly give you 6 Black Hole Commendations per week while bosses in store mode Explosive Conflict and Nightmare KP give you 2 Black Hole Commendations per boss. the dailies on Corellia Black Hole area give you the same Daily Commendations that Belsavis/Ilum dailies give you now. In addition, Corellia Black Hole area also have a weekly that give you 6 Black Hole Commendations per day. Hey dulfy, thanks for all your guides and posts! You may want to mention that space mission dailies also yield daily tokens, and that PvP adrenals and medpacks are doubling in cost in 1.2 (and also halving their cooldown), so stocking up on them is viable for PvPers. That is a good point, I will add that in, thanks! could you clarify are the black hole comms the same as regular daily comms? if i save 200 daily comms now does that mean i can buy a new relic as soon as the patch hits? Just wondering, but all space missions give daily coms? Do you have to be 50? Just one space daily – I think you gotta be at least 48 to pick up the daily. It give you 2 daily comms per day. Hmm I only had experience with the first boss and that appears to be the case – ranged tend to fare better. How to do all the companion mission, four of my companions are already at 10k, how do I get the missions, or will the just appear from time to time? The relics say ‘On Use’ even if they add a damage proc (e.g. Dark Radiance). Are these a short term clicky like the +power PVP relics, or do they merely sit there and add the proc continuously at their specified rate? As in when clicked and for 20 seconds only; or just when equipped? I had thought the proc ones were continuous. The procs are continuous, I think the on use part is a typo. Does anyone know if you can trade in your Battlemaster armor for War Hero armor even if you’ve removed or changed the mods? is one of best relic atm. But the other one? “Internal” or “Elemental” dmg. Which one is good to choose? Where is the kinetic dmg relic? Yes very possible. In fact on the PTS when we were trying to get the legacy info one of the guys had his guildies PL him past chapter 1 or 2 (can’t remember). I have a bunch of epic 49 augments saved up from slicing prob 40ish do you think i should try to sell these right when 1.2 hits or would it be better to sell them now because i know demand will go up for augments but since other profs can craft them im not sure, any thoughts? Prince/Sovereign will be tradeable in 1.2? Hey Dulfy, Can you put up an article about the new Spec / build changes for Sith Soc / Jedi Sage. I know we are getting nerf as a healer but can you post something about it. What’s up with the new ship Droid parts? I have to buy the repair droid first, then I can purchase Droid parts to buff my Ship Droid’s Crew Skills? What exactly does this repair droid sell? But is that it? I’ve been trying to hunt down a screenshot of the droid’s shopping window (like you so generously laid out for the guild banks/legacy system 😀 ) I’m looking for specifics like the cost of the upgrade parts, and the crew skill bonuses for the items. All I know is that he costs me a cool million, and I can buy something to shut up my other droid, and I can buy something else to make him better at (a particular?) crew skill. Sorry didnt post this sooner 😛 I think there was a thing or 2 more (I do not have it myself). Im still a little confused about how reverse engineering will work. What happens exactly if I RE a Battlemaster chest piece? Does it destroy the item and teach me the schematic? Im assuming if you craft something from the learned schematic it will be BoP? Or does something else happen? Another question: How exactly does the set bonus tie to armoring mods. After the patch hits can I take the Armoring mod out of a battlemaster chest piece and put it into any orange chest and retain the set bonus? Or can I only do that with the armor sets that come out in the new patch? The details about RE is still fairly murky, it is still not flushed out on the PTS entirely. It will destroy the item and give you a schematic for an orange shell (no stats, just empty shell you can put stuff in, but has the identical look). Something they will add in a future patch to the PTS is the ability to see exactly what % success chance you will have in getting that schematic. Not really sure if it is BoP or not but I will ask around and see if anyone knows.Also something just added to PTS today is a bag you can buy for 50k credits that give you schematics for full (5 piece) set of BM and Rated War Hero gear. The schematics you can learn if you are armsmech or synthweaver but to use the finished item you need valor 60 for BM or a certain PvP rating for Rated War Hero. Not sure if that is the case going into live servers but that is something that they just put in. So for the set bonus. Pre 1.2 items (i.e. BM, Rakata), the set bonus remains with the item. With the new endgame stuff in 1.2 (i.e. War Hero, Black Hole, Campaign), set bonuses are transfered with the armoring. So the interesting question is what happens if you xfer an armoring from one of the new 1.2 items into a pre-1.2 item (where set bonus is retained in the item). Does the new set bonus overwrite the set bonus already on the item? (likely), do you end up with two set bonuses? (would be nice but probably not the case) or does the original item set bonus overwrite. 50k credits for each piece or for all of them? No other requirement (like valor or WZ commendations) to buy these schematics or craft these items? What crafting materials do these require? I presume they are all 400 skill recipes. It would be good to have the option to have the old BM gear look (I quite like the red/black trooper armor) but have gear with the augment slot. Are these shells or a complete item? The Rated gear is a shell when you buy it; the BM gear has mods in it. This is very interesting to me. Hey, yes it is 50 k to buy the entire bag of 5-piece schematic. You need armsmech or synthweaving 400 to craft them (armsmech uses durasteel, thermoplast flux, zal alloy, ciridium). The catch is that these crafted shells are BoP and you need either valor ranking (60-70) for BM or PvP rating for War Hero to wear these shells. Is there anyway to confirm that the changes to augment stats will be retrospective? Or will pre-1.2 augments still have the same stats as currently? I am actually considering buying a white +41 power crystal just to stand out. But I only have 3 mil. Oh well, screw it, I’ll run more dailies. Whee. Thank you Dulfy! Keep up the awesome work my guild and I really appreciate it! do I get my alt’s class buffs aswell if I use mine in a warzone? yup, you should assuming that you have leveled your alt past chapter 2. 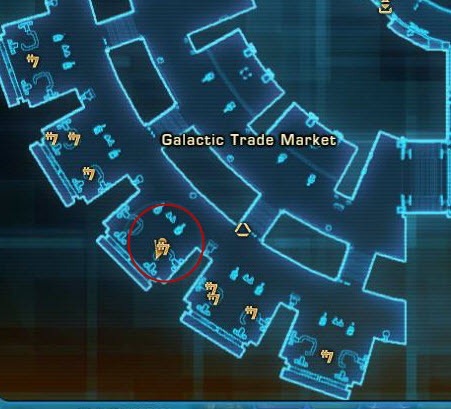 Dulfy, do you know if schematics that drop in Operations, for example Exo Synthweaving schems, will be tradeable in 1.2 or will they remain BoP? Hey Dulfy. Were you able to find out if you could trade craft BM gear for unranked War Hero vendor gear? The Dev’s said this weekend at Pax east that items you have now that are currently BOP will stay BOP once 1.2 drops even if ‘new’ items are BOE (Such as rakata energy nodes). May want to fix that since you tell people to horde them. Well that’s not surprising coming from bioware haha, Hope they do change though.